I recently was asked the question about what paper I use for foundation piecing. I wish it was a straightforward question, with one definitive answer. But there are so many options on the market nowadays. I used to use just plain old copy paper (20 to 24 lb) and I would run my templates through my printer at home. When I was in my heyday of teaching foundation piecing quilt classes, I used to provide the patterns to my students. Since that was about the only paper that anyone used in those days, it was fine. The key then, and now too, is that your stitch length MUST be reduced to 1.9 to 2.0 mm. (Normal is 2.4 to 2.5). And you must start and stop 1/4" ahead of the beginning and after the ending of your pattern stitch line. After a few years, I stumbled into foundation piecing classes taught by Judy Niemeyer . She provides all of the foundation paper with her patterns. She uses newsprint paper, which is lighter weight (30 lb) than copy paper. It tears easier, which is great when you need to remove the papers. But it also is apt to tear if you have to rip out your seams and resew on the same line. You can get newsprint paper in various sizes at a well stocked art supply store or from Amazon. I recommend Blick in both Portland and Seattle. 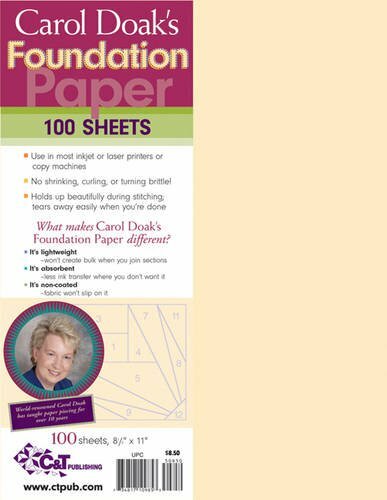 Carol Doak also sells newsprint foundation papers, and they are readily available in most quilt stores or online. They come in 8-1/2 " x 11" sheets and are easy to run through your printer and they tear away nicely. Some manufacturers now make dissolving foundation paper. Two sellers of these papers come to mind. 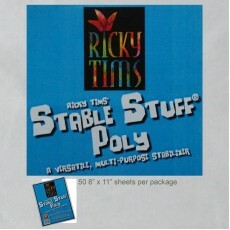 Ricky Tims sells a product called stable stuff poly. He sells it by 8-1/2" x 11" sheets or by the 3' roll. If you use these to paper piece, you do NOT have to remove the paper when you're done; it dissolves into fibers when the quilt is washed. Sharon Schamber also sells a similar paper, called Sharon's Secret Foundation. It comes in a roll that is 19" wide x 5 yards. These products are quite firm and may be difficult to piece into curved seams, but are excellent for straight sections (think sashing with a lot of little points). I use the stable stuff poly for almost all of my machine applique. If you look at embroidery stabilizers at a well stocked retail store, you will find all kinds of dissolving products there too. Since I haven't used any of the embroidery stabilizers myself, I can't recommend one over another. Here's hoping that you find the foundation piecing product that you enjoy the most.